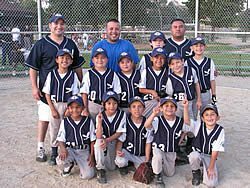 Park Forest, IL–(ENEWSPF)– Just one week after the Colt team won their sectional title in the Pony National Association tournament, the Park Forest Storm took the field in the First Annual Park Forest Thunder and Lightning tournament for 8 year-olds and under. 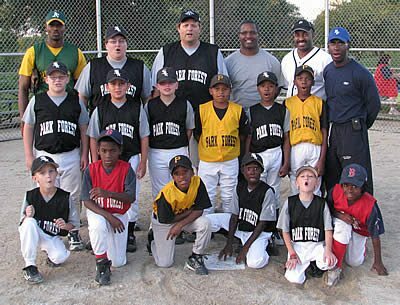 On July 30, pool-play began between Park Forest, Omega Delta (out of Chicago), Oak Lawn, and West Side Youth League. Each team played the other three teams once and then the records were calculated. At the end of this round three teams had a 2-1 record: Oak Lawn, Park Forest, and Omega Delta. The next category used to break the tie was runs allowed; the total number of runs a team allowed to be scored against them in the three games. This factor seeded the Omega Delta team as #1, the Oak Lawn team as #2, the Park Forest team as #3, and the West Side team as #4. So the teams then played the elimination games on Saturday afternoon and evening to determine who was going to the Chamionship game on Sunday. The Omega Delta team held on in the last inning to beat the West Side team, while the Oak Lawn team beat the Park Forest team. The pairing for the Championship was then Omega Delta and Oak Lawn for first and second place, while West Side played Park Forest for third and fourth place. In the end West Side beat Park Forest and finished in third place and Park Forest in fourth, while Omega Delta beat Oak Lawn to finish in first place and Oak Lawn in second place. This tournament was very exciting for the Park Forest Storm in several ways. The Storm was made up of two players from the Park Forest Pinto Pirates, two players from the Park Forest Pinto Red Sox, eight players from the Park Forest Pinto White Sox (winners of their division in PFBB’s regular season), and one player from the Richton Park Diamond Backs. The team had only two weeks of practice together as a unit but worked quite hard. As a result, the team made many spectacular defensive plays throughout the tournament. (The Pinto division of the regular PFBB season is where teams first play real games for wins. Thus, it is a learning experience at that age and routine defensive plays take a while to learn.) Quite a few of the Storm show hitting prowess during the regular season and continued to show their ability during the tournament. 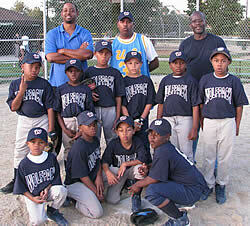 DJ hit a homerun in two separate games and Malachi chipped in with a homerun during a game as well. Nick was not far behind, as he had a triple over the weekend. In this tournament a lot was asked of the Storm, as they played a game on Thursday nite, Friday nite, two games on Saturday, and 1 game on Sunday. They also competed in the Skills Competition for each team. Since the PFBB players rarely play games two days in a row, this was a very big physical challenge for our 12 boys and 1 girl (yes….a girl, and the only girl who played in the tournament!!) So asking them to play two games in one day was definitely taxing on them and by the second game you could see the fatigue set in. By Sunday, they were totally spent. But despite the fatigue, they still made some good plays in the field and never got shut out! And even though they finished in fourth place, they were the only ones to defeat the eventual champions! PFBB is very, very proud of these youngsters. 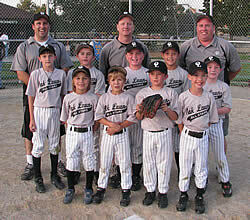 I have watched them improve over the season, as I am one of the coaches of the Pinto White Sox. All 13 players went into this tournament not knowing what to expect, as they had never played in a tournament much less as a team. They faced some very good teams and showed no fear. They were competitve in each game they played and showed team spirit down to the very last out. They were good sports even in losing. And the few tears I saw over the weekend showed me that these players (as young as they were) wanted to do well for their teammates and their fans. I cannot express how proud were are of these players. We are also very thankful to have had such supportive parents of the players. They are the ones who make this possible! Park Forest Baseball would also like to extend a large thanks to the visitng teams who competed in this tournament. The parent support of each team was impressive, as each team was travelling 45 minutes or more each day to Park Forest for four consecutive days. The managers and coaches were also very enjoyable to work with and provided great feedback with which to make improvements next season. All of the teams showed great sportsmanship, both in winning and losing. PFBB is looking forward to the 2010 tournament already!